Celebrating the Creative Spirit …. The Music Ministry at Pinnacle Presbyterian Church is a place to deepen your connection with God, explore and strengthen your individual creativity, and celebrate the Creator through the glorious gift of music. Singers, ringers, instrumentalists, and listeners — young, old, and in between — all have a place in the music ministry at Pinnacle. So whether you’re interested in joining one of our ensembles or experiencing the incredible music of the Pinnacle Concert Series, we are sure there is something for you. The Chancel Choir is the primary musical ensemble providing weekly worship leadership. Its role is to lead and encourage congregational singing and to present inspirational anthems of prayer, praise and devotion. In addition to singing at Sunday and special worship services, the choir prepares and presents larger choral works with a variety of instrumental ensembles. Membership in the choir is open to all and registration can be made by contacting David Allen. Bella Voce is our women’s ensemble. This new ensemble will sing regularly in church and for special events in the community. This four-part ensemble (SSAA) will cover a variety of classical and contemporary styles and open to all women who enjoy singing. Additional information and registration can be made by contacting David Allen. Pinnacle Pealers is the adult handbell choir. 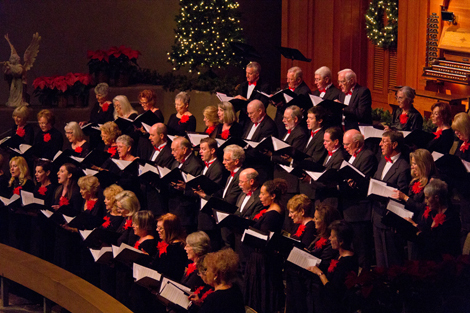 The choir regularly performs at Sunday worship services and for special events in the community. No previous handbell experience is necessary but the ability to read music and commit to a weekly rehearsal is required. Additional information and registration can be made by contacting contacting David Allen. Cholla Chimers is the handchime choir for all first and second graders. The group rings for Sunday worship several times throughout the year as well as participates in the Christmas pageant and other special events. Additional information and registration can be made by contacting David Allen. 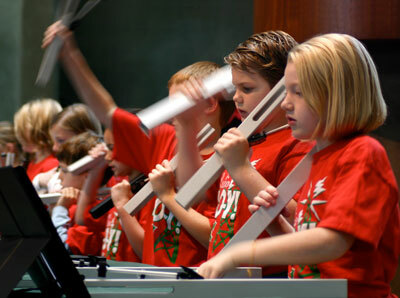 Canyon Ringers is the handbell choir for those students in grades 3–5. Some previous ringing experience is a plus but not required to ring in this choir. The group rings for Sunday worship several times throughout the year as well as participates in the Christmas pageant and other special events. Additional information and registration can be made by contacting David Allen. For more information, contact David Allen. 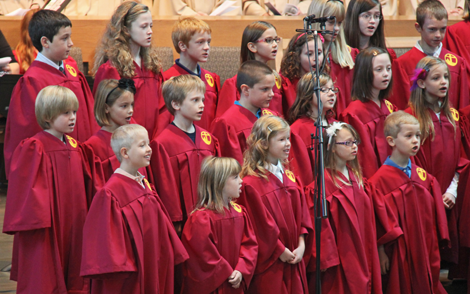 This is the singing choir for children ages 5–7 (K through Grade 2). In this choir, children will learn beginning vocal and rhythm skills and musicianship through musical games and activities. Students will learn hymns, rounds, and one or two-part songs by ear to sing in the 10am Sunday worship services throughout the year. Cholla Choir also participates in the Christmas pageant, the Christmas Eve Service, and other special events. For more information, contact David Allen. This is the singing choir for children in grades 3-5. This choir learns beginning sight-reading, and vocal and rhythm skills through musical activities. Students will also have the opportunity to explore their individual musicianship by singing in small groups, solos and duets. The Canyon Singers sing one or two-part songs in the 10am Sunday morning worship throughout the year, as well as participate in the Christmas pageant, the Christmas Eve Service and other special events. For more information, contact David Allen. The Sonoran choir is for enthusiastic students in grades 6-12 who love to sing! This fun, inclusive choir focuses on learning basic vocal technique and cultivating individual singing styles. The choir learns songs of various styles, including Gospel, Classical, Contemporary Christian, Jazz and A cappella, and sings in the morning worship services throughout the year. Though sheet music is used, students are not required to read music. Additional information and registration can be made by contacting David Allen. This new and exciting ensemble will have you playing island style in no time! Members will learn a variety of musical styles including calypso, reggae, and the samba. In addition to performing on the pan, members will study the history of Trinidad and how the pan was created. The fall will be spent concentrating on steel drums exclusively and in the spring Africa Drums will be introduced in addition to more Steel Drumming. Ages 6 - Adults. Additional information and registration can be made by contacting Sonja Branch.